One of the instructional themes in Teaching the Story is that the details which an author includes make a difference in depicting a character, setting, or time period. I am repeatedly reminded of this fact in my own reading and writing. Recently I wrote a scene in my historical novel where my character puts her dog on a leash and walks him. Several days later, I interviewed George Snyder, a native Charlottean who lived in Myers Park in 1950—-the place and time period for my book. While showing me the house he grew up in and talking about his childhood George said, "We all had dogs. They weren't penned like they are nowadays. They would just run after us on our bikes. No one had leashes." I wouldn’t have guessed that in 1950 in Charlotte, NC dogs weren't on leashes. A minor detail, but one that is now correct. In a few years when you read Half-Truths and you come across a savory detail—be sure that I have thought long and hard about including it. And if initials appear in a shutter somewhere you'll know there is a reason why. When my daughter Lori graduated from Covenant Day School three years ago, she challenged me by saying, "Mom, you've got a lot of time now. I think you should volunteer somewhere." I don't know about the "lots of time" -- but I did agree that I could be more involved on a volunteer basis in the community. Since my love is literacy, I approached Covenant Day High School and volunteered to coordinate a tutoring program. Together with volunteers from Christ Covenant Church, we are now in our third year. Last year we added a monthly trip to the school library as well as playing educational games when the students are done their work. Here is a slideshow including one of the library trips, tutoring, and our recent holiday party. The Alliance for Young Artists & Writers invites students in grades seven to twelve to participate in the Scholastic Art & Writing Awards of 2010, the nation's longest-running, largest, most prestigious recognition program for creative teenagers in the literary arts. Scholarships are provided from a pool of $3.25 million in tuition support, the largest source of funding for teens in the arts. The top five writing portfolios submitted by graduating seniors are recognized with Portfolio Gold Awards of $10,000 each. Deadline is January 10, so you'll have something to do when you get back from winter break. Back in November when I was a presenter at AASL, I got to play hostess to several authors who were also attending the event. I warned them ahead of time that the only "payment" I wished to receive was autographed copies of their books. They graciously complied and my library is richer. As I read them, I will share them with you. My School in the Rain Forest by Margriet Ruurs (Boyds Mills Press, 2009) is a wonderful addition to her other book, My Librarian is a Camel. Through beautiful photographs and interesting text, Ruurs shows how children attend classes in such varied places as an outdoor school under a tree in Kenya, onboard the MV Anastasis hospital ship, and in a floating school on a lake in Cambodia. Children from kindergarten through middle school will learn from this eye-captivating book. I usually just blog about literacy. But when my daughter Lori (who is studying in Spain) posted this video on Facebook, I couldn't resist sharing it with you. Hope you enjoy it! Besides...just think of all the literacy skills that were used to put this video together! Look Mom, I'm in Highlights! Do you remember reading Highlights Magazine in a doctor's office as a kid? Remember the page where other children sent in poetry and drawings? Didn't you always want to see your own work displayed in those pages? Children's writers and illustrators still aspire to be published in Highlights. For many of us, it's a milestone that once we reach it, we feel that we've finally "arrived." Excerpted by permission from Talking Story, a newsletter by Joyce Hostetter and Carol Baldwin. When Joyce suggested this title for an article, we both laughed. How many of you remember writing that familiar essay? I was fortunate to travel five times this summer. The most exotic destination was fourteen days in Austria, the Czech Republic, and Germany. The most writing-intensive destination was the Highlights Foundation Writers Workshop in Chautauqua, New York. For years I dreamed of attending; and when my writing buddy decided to go, we took the plunge, paid our deposits, and signed up. Joyce said it would be life changing. I'm expecting she'll be right. If you're serious about writing or illustrating for children, this is an event you want to attend. For five days, one hundred-plus participants are surrounded by a faculty of twenty-two authors, illustrators, and editors whose desire is to see you produce your best possible work and get it published. Workshops, speeches, networking times, and critique sessions with faculty stuff each day to the brim. I was challenged by both Patti Gauch and Harold Underdown (my critiquer) to find out what the character in my historical novel truly wants. Patti said that this desire must be the "arrow that drives the book." I learned about dialogue from Donna Jo Napoli, a sense of place from Kim Griswell (pictured below), and about beginnings and endings from Peter Jacobi. There were forty-five workshops offered—more than enough to inform and saturate every participant. One of the benefits of the intimate atmosphere was schmoozing with other aspiring writers, famous authors, and accessible editors. I think I'll never forget the image of Jerry Spinelli (pictured below), walking hand-in-hand with his granddaughters to the bus taking us to a picnic. With his flannel shirt and jeans, he is the most casual famous individual I've ever met. (His granddaughter, by the way, had an autograph book and was collecting autographs of other writers. I think she was sweetly oblivious to the fact that her grandfather was probably the most famous writer there.) I enjoyed meeting Carolyn Yoder, Joyce's editor, and Andy Boyles, the science editor at Boyds Mills Press, who expressed interest in my glass book. Life changing? Stay tuned. I'll let you know as the year progresses and I practice what I learned in beautiful Chautauqua, New York. I, for one, would love to go to Chautauqua every summer. But Chautauqua is more like a once-in-a-lifetime experience. So I didn't let my mind dwell on that idea. Instead I planned to mostly stay at home. I was tired of traveling during the school year and wanted to save my away time for a writing retreat in late summer. So during the last full week of August, I indulged in a week in northeastern Pennsylvania at one of the Highlights Founders Workshops. These events, no matter the workshop title, are writer's heaven. At each one I've attended, I've grown as a writer and made new friends. This event was a writing retreat with my Calkins Creek editor, Carolyn Yoder, and ten alumni retreaters. It was the perfect summer vacation! 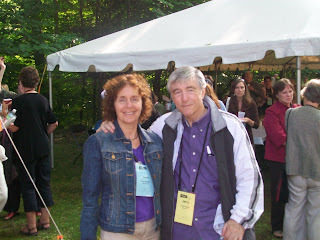 For more information about the Highlights Foundation Writers Workshop at Chautauqua or our Founders Workshops near Honesdale, Pennsylvania, visit www.highlightsfoundation.org or contact Jo Lloyd at contact@highlightsfoundation.org. Please feel free to share this e-mail with others who may be interested.